When will be Live with Kelly & Michael next episode air date? 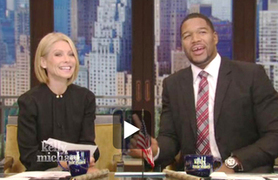 Is Live with Kelly & Michael renewed or cancelled? Where to countdown Live with Kelly & Michael air dates? Is Live with Kelly & Michael worth watching? The show began in 1983 as "The Morning Show", a local New York program on WABC-TV with Regis Philbin and Cyndy Garvey as co-hosts. In 1985, Gifford, then known as Kathie Lee Johnson, replaced Garvey (and her successor, Ann Abernathy). In 1988 Buena Vista Television began syndicating the show nationwide. The title was also renamed to "Live with Regis and Kathie Lee". On July 27, 2000, Gifford decided to leave the show. The show was renamed "Live with Regis", as Philbin hosted alone or with varying guest hosts. During "auditions" for co-hosts, Kelly Ripa became a favorite and front-runner, Ripa was subsequently named the permanent co-host on February 5, 2001, and began her duties on February 12. After celebrating their 10th anniversary together, Regis announced in early 2011 he would be leaving the show that year. He presented his final edition on November 18th 2011. The show was then renamed "Live with Kelly" and a audition process similar to the one Kelly went through took place to find Regis' replacement. When the show entered it's 31st season, Michael Strahan was introduced as his official replacement. EpisoDate.com is your TV show guide to Countdown Live with Kelly & Michael Episode Air Dates and to stay in touch with Live with Kelly & Michael next episode Air Date and your others favorite TV Shows. Add the shows you like to a "Watchlist" and let the site take it from there.